Concrete flooring is eminently practical, durable and attractive, which is probably why its popularity is on the rise with savvy homeowners. You can improve the aesthetics of your concrete flooring easily by staining it, either with a uniform application of a single stain color or by using multiple shades of stains to create simple or intricate patterns or designs. Although staining is a big job, requiring some effort and time, the rewards can be significant in both preservation of the concrete flooring and the aesthetics of your home. If your concrete floor has been previously painted, you'll need to give it a little extra attention before staining it. First, if possible, use a power washer, which is available for rental from most local home improvement stores, on the painted concrete. This should remove most of the paint, and you can tackle the remaining paint by scraping with a wire brush. Alternatively, or if the power wash method isn't effective, apply a generous amount of paint stripper. You'll want to leave the stripper on the concrete for about an hour. The paint will begin to loosen and separate from the concrete. The longer you can allow the stripper to set, the less work you'll have to do to scrub the paint off. Finally, spray the concrete with a garden hose to remove the gel from the concrete for outdoor concrete slabs. If you're working with an interior concrete floor, use a wet towel. In either case, give the concrete sufficient time to dry completely. Once you've removed the existing paint, or if your concrete floor is unpainted, the next step is to clean and fill the floor. First, scrub the floor with a scrub brush, soap and water. Vacuum up any tiny particles that may remain on the surface. Use a crevice tool to remove debris from inside any seams or cracks. The floor surface must be completely free of debris before staining. Next, fill any cracks in your concrete with concrete glue and a woodworker's syringe. This tool includes a small needle on the end for better application and access to smaller cracks. Use a damp sponge to wipe away any excess glue. Allow the glue to dry for at least an hour. When the glue is completely dry, mix anchoring cement according to the manufacturer's directions. Using a small putty knife, press the cement mixture into any cracks in your concrete floor. Scrape away any excess mixture to ensure that the surface is completely smooth, with no bevels or creases. After the cement has dried completely, scrape away any excess cement with the putty knife. Then sand the area smooth with drywall sand screen. If you plan to create a pattern or design on your floor with the stain, you'll need to mark that pattern before beginning. The recommended method is using painter's tape to "draw" your design or pattern on the floor. Taped areas will remain stain-free, and thus keep the original color after the first application. You can then remove the tape from the protected areas, apply it over the dried stained areas, and use a second color to create your design. Repeat this process as many times as you need to complete your planned design or pattern on the floor. Next, it's time to actually apply the stain. You'll want to don protective clothing and gloves here in order to avoid damage to clothes and skin from the stain mixture. Begin by mixing the stain. Follow the manufacturer's directions here because the precise process may vary – sometimes significantly – depending on the specific manufacturer in question. Next, wet a scrub brush with water, then position the brush where you plan to begin applying the stain. Pour a small amount of stain onto the water spot. Pouring directly into the puddle of water prevents the stain from creating a darker color at the initial point of application. Immediately scrub the concrete area using your water-soaked scrub brush with circular motions. This helps the stain seep evenly into the concrete's pores, allowing the stain to react properly. Once the stain is applied, go back over the stained area with a wet-dry vacuum to remove any excess stain. This helps neutralize the stain and ensure an even coverage. Then, clean the concrete with a small amount of floor-cleaning solution and water. The final step – buffing and damp mopping – is best accomplished with the help of an assistant. 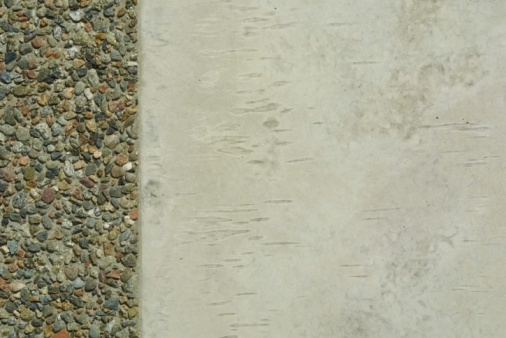 One person should start in one corner, buffing the stained concrete with a soft buffing pad. The second person should follow right behind the buffer with the wet-dry vacuum and a damp mop to remove any residue and set the stain. Faux finishing is an optional step that can add depth and visual interest to your newly stained concrete floor. Apply faux finishes using acrylic concrete stain. Mix the stain with an equal amount of water, then dab the stain onto the floor with a clean, damp workshop towel. The faux finish process allows for a lot of creativity. You can explore faux painting techniques for this step, including fan, feather and sponge processes. Allow the acrylic stain to soak into the concrete completely before moving on to the final step. Last but not least, you'll want to seal your work with clear epoxy sealer. Mix the sealer according to the manufacturer's directions. The resulting mixture should take on the consistency of interior paint. Use a roller to paint the concrete floor with the sealer and be sure to cover the entire surface of your floor. You may need to switch to a paint brush in order to ensure solid coverage alon corners and against baseboards.